The Mesa Boogie Grid Slammer can produce every kind of low gain overdrive you could require, from vintage edge-of-breakup sounds through to mild overdrive - perfect for blues and classic rock. The Grid Slammer features a natural mid-range hump which complements your guitar's most prominent frequencies and helps you cut through any mix, while the Tone control lets you sculpt the treble response to exactly how you require. The Grid Slammer has a highly musical response that enhances the character of your own guitar and amplifier, along with the nuances of your playing. 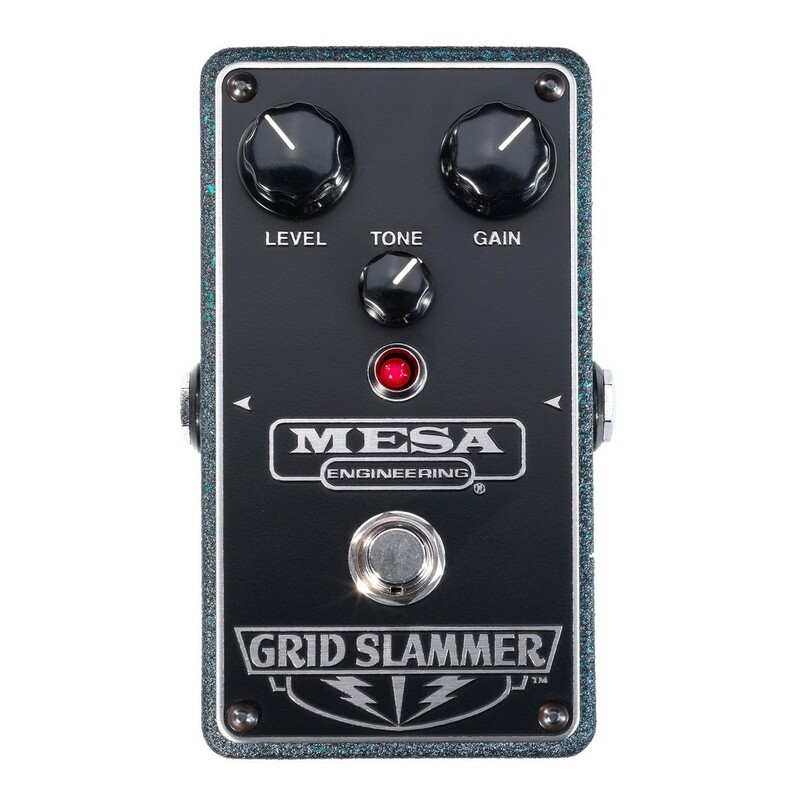 Featuring true bypass operation for optimal signal clarity, along with Mesa Boogie's renowned quality and durability, the Grid Slammer is a professional low-gain pedal that would be a welcome addition to anyone's pedalboard. 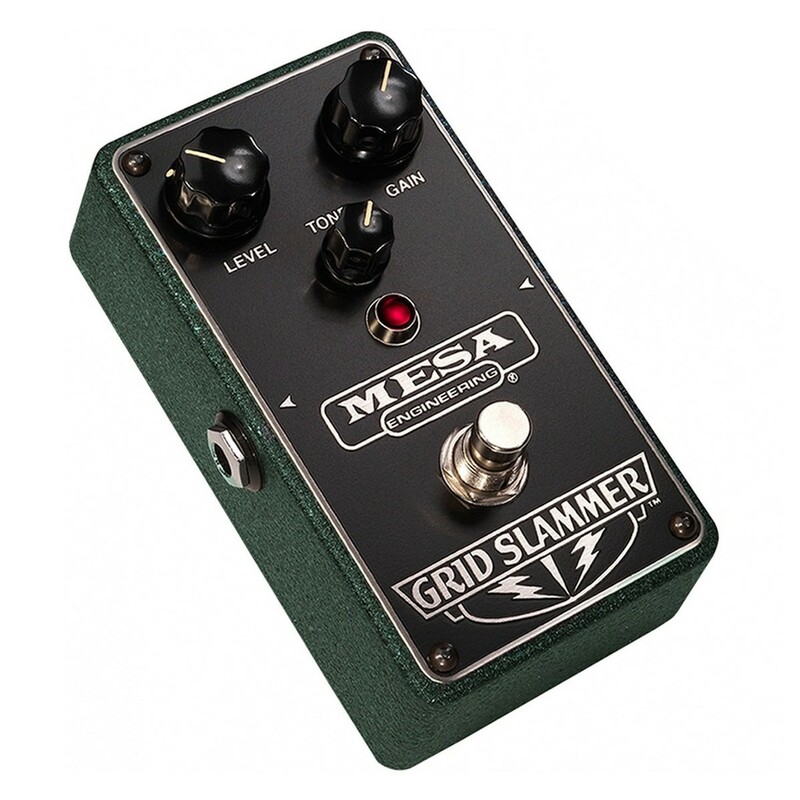 The Mesa Boogie Grid Slammer is designed to produce a low-gain tone that can cover vintage breakup to classic overdrive sounds. It features a highly musical and responsive design that reacts to your guitar and amplifier setup to create a wide range of tones. When used with a clean amplifier, the Grid Slammer can be used to push your tone into an edge-of-breakup sound, or a vintage style overdrive. When used with an already-overdriven amp, the Grid Slammer will take your sound into increased saturation and can be used to create a smooth solo tone - perfect for blues and rock. The Grid Slammer features a mid-range hump that gives your guitar's most important frequencies an extra boost, providing a smooth and singing tone that will cut through any mix. The mid-range hump complements the character of the overdrive to create a harmonically-rich tone that can, in Mesa's words, "both sting and sing". The Grid Slammer features a Level control which can boost your signal up to +20dB. This can push your amplifier into increased saturation and compression, depending on how much headroom you have available. An additional Tone control lets you sculpt the treble frequencies, so you can have either a biting and raucous tone or a smooth and sultry sound. The Grid Slammer has a true bypass which means you'll maintain optimal signal clarity when the pedal is disengaged. It is designed and handcrafted in Petaluma, California, and features the renowned build quality and rugged construction standards that Mesa Boogie is known for.
" PROS: Dependable, natural mid boost/overdrive. Into a very high-headroom clean amp there's enough on tap to get you driving nicely into blues and lighter rock territory, with extended dynamic control under your fingers, but not enough for singing, liquid hard rock. The midrange fattens up Strats and Teles; Les Pauls, 335s and the like get extra chewy harmonic overtones." Petaluma-based Mesa Boogie is an American amp manufacturing company, established in 1971 by Randall Smith as a small repair shop initially. After producing amplifiers for prominent early customers including Carlos Santana and Ron Wood, Mesa Boogie quickly gained a reputation as a high-end amp designer with its iconic Mark Series amplifiers, still produced today. Mesa Boogie is now a prolific company with a key range of amplifiers including the Mark series, the Rectifier series, and the Express line. With players in all genres, from progressive metal to blues, rock, jazz, alt-rock and more, Mesa Boogie is widely regarded as one of the ultimate premium amplifier manufacturers, with a huge fan-base and diverse range of professional players.